We whose names are hereunto Subscribed do solemnly promise and swear that wee and each of us will faithfully discharge the Trust of Members of Council for ye Government of the Province of Pensilvania and Territories to which wee are called to the best of our ability and understanding and that the Secrets of the said Council we will inviolably keep. Wee whose names are hereunto Subscribed do Declare in the presence of Almighty God the Witness of the Truth of what we say That we and each of us will faithfully discharge the Trust of Members of Council for the Government of the Province of Pensilvania and Territories to which wee are called to the best of our ability and understanding and that the Secrets of the said Council we will inviolably keep. In 1701, before leaving Pennsylvania to return to England, William Penn instituted the Charter of Privileges (sometimes referred to as the Charter of Liberties), which established his colony’s fourth frame of government. One significant clause codified the right to freedom of conscience by providing an option other than oaths for office-holders: “all Persons who also profess to believe in Jesus Christ, the Saviour of the World, shall be capable (notwithstanding their other Persuasions and Practices in Point of Conscience and Religion) to serve this Government in any Capacity, both legislatively and executively, he or they solemnly promising, when lawfully required, Allegiance to the King as Sovereign, and Fidelity to the Proprietary and Governor, and taking the Attests as now established by the Law.” This freedom was not without controversy, it being held by the Queen-in-Council that oaths were mandatory. However, the religious beliefs of the Quakers prohibited their taking oaths. Pennsylvania’s Provincial Council comprised both Quakers and non-Quakers. Following Penn’s 1701 Charter, and an additional 1704 Act of the Assembly concerning the regulation of courts, members of the colonial government professed oaths or affirmations, depending on their religious persuasions. Thus, the present document is divided into two halves. 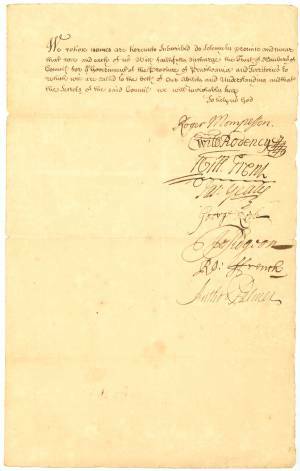 The first page is signed by eight non-Quaker members who took the oath written at the top of the page. Under Penn’s 1701 Charter, Councilors were appointed by the Proprietor, or by the proprietary governor, and served as an advisory body with little formal powers, but great social stature. 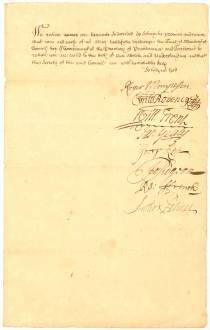 It is notable that this document includes the signature of William Penn, Jr. (whose signature is nearly identical to that of his father). Penn, Jr. was only in the colony for six months in 1704, during which time he caused quite a number of disturbances, including a tussle with a member of the city watch. Isaac Norris would write to a friend in September 1704: “William Penn, Jr., is quite gone off from Friends. He being in company with some extravagants, that beat the watch at Enoch Story’s … He talks of going home in the Jersey man-of-war next month. I wish things had been better, or he had never come” (quoted in Janney, The Life of William Penn). Although intended from its inception as a place where Quakers could escape persecution and practice their beliefs without ramifications, the issue of their refusing to take oaths would continue to be questioned in Pennsylvania and England. According to one historian, “In Pennsylvania the dispute over the use of affirmations became complicated by the battles between the governors and the assemblies over establishing courts, and battles between Anglicans and Quakers over control of the colony. Pennsylvania Anglicans were few in number but had the backing of the Bishop of London and a revitalized Church of England … The resulting battle occasioned 25 years of intricate political maneuverings and threatened the existence of the unofficial Quaker establishment in Pennsylvania. The conflict involved the meaning of religious liberty to two groups with diametrically opposed views on the necessity of oaths” (J. William Frost, “Religious Liberty in Pennsylvania” in Pennsylvania Magazine of History and Biography, vol. 105, no. 4). 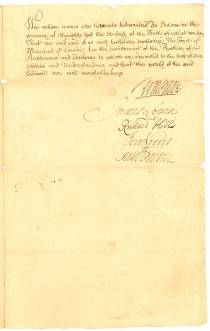 William Rodeney [Rodney] was the grandfather of Declaration of Independence signer Caesar Rodney of Delaware. James Logan (1674-1751) was an English-born Quaker and longtime secretary and proprietary agent in Pennsylvania, acting first for William Penn and then for his son, Thomas Penn. Logan came to Pennsylvania in 1699 and quickly joined the colonial political elite, serving in such offices as commissioner of property, receiver general, Mayor of Philadelphia, Chief Justice, and member of the Provincial Council. He was also an amateur scientist, bibliophile, land speculator, and fur trader, and one of the wealthiest men in the colonies at the time of his death. With Thomas Penn, he engineered the infamous “Walking Purchase” of 1737, defrauding Delaware Indians of thousands of acres on the upper Delaware River.